Since 2001, there have been more women than men on the Register and their role in the profession has been firmly established. In celebration of International Women’s Day this year the charity approached a number of women working in the profession today about their role models and experiences. My role models are my parents. My mother has always taught me the importance of being independent while my father has always taught me that with hard work you can achieve anything. What was the defining moment in your career or study? While interning in Parliament, I was asked to look into drug and alcohol figures for a discussion. This highlighted to me the broad nature of the Pharmacy degree, which is often split into community and hospital, and gave me aspiration to include my Pharmacy degree with other passions, which include politics and PR. What does it mean to be a woman in the profession? There are currently more female than male pharmacists and I feel this fits in with the idea that Pharmacy is a female-friendly profession. I think there will still be occasions where patients will come in and expect the pharmacist to be the only man in the pharmacy but I think this is becoming rarer. There are distinguished female pharmacists at the forefront of the profession including Nadia Bukhari and Dr Catherine Duggan and I feel that the profession values merit over gender. Do you have any wellbeing tips or coping mechanisms that might help others in the profession? I’m a big fan of Twitter, it’s an excellent way to network and I find it very therapeutic. I have recently discovered mantra meditation which can be quite energising and helps me to focus. I think healthcare professionals can understand when a patient is suffering, but are less accepting when it is themselves, so it is really important to support others wellbeing. A cup of tea and a chat can go a long way. Why did you participate in a challenge for Pharmacist Support? 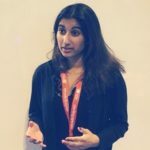 Having attended the Pharmacy Show since I was very young I have been aware of Pharmacist Support for a long time and it was great to finally get involved. Looking at the charity’s website shows how they are utilising donations carefully. I participated in the 2014 London Santa Dash because I wanted to raise money for the charity and catch the running bug. I’ve always enjoyed swimming and Zumba at the gym but I wanted to try something new. Undertaking this challenge was the perfect opportunity. Any tips for anyone wanting to undertake a challenge for Pharmacist Support? Just go for it. I was worried that I wouldn’t raise enough money but thanks to the generous donations of friends, family, university colleagues and Twitter followers I needn’t have worried. Utilise social media and encourage friends to garner further support. Setting up a number that supporters could donate to via text was also very useful.